Regeneration: will the 13th Doctor be black or female? Doctor Who fans have called on the programme's newly appointed lead writer to seize the opportunity to appoint a black or female actor as the 13th incarnation of the Time Lord following the announcement of the departure of Peter Capaldi. The current Doctor will regenerate in the Christmas special at the end of this year's series, and the Broadchurch writer Chris Chibnall, who will take over in 2018, is being urged by some viewers to take the programme in a new direction. A decision by Chibnall and the BBC is not formally due for months, but online speculation has focused on the actor David Harewood, of Homeland and Supergirl, Richard Ayoade of The IT Crowd, Olivia Colman, who worked with Chibnall on Broadchurch, and Ben Whishaw, who plays Qin the James Bond films. It is not the first time that the subject of diversity has been aired. The current showrunner Steven Moffat said the Doctor role was previously offered to a black actor but "for various reasons, it didn't work out". Pearl Mackie, whose father is from the West Indies, has been cast as the Doctor's next companion, and Moffat said it would be "amazing" for the show to have two non-white leads. Harriet Harman, the former Labour deputy leader, said Capaldi had been an excellent Doctor. 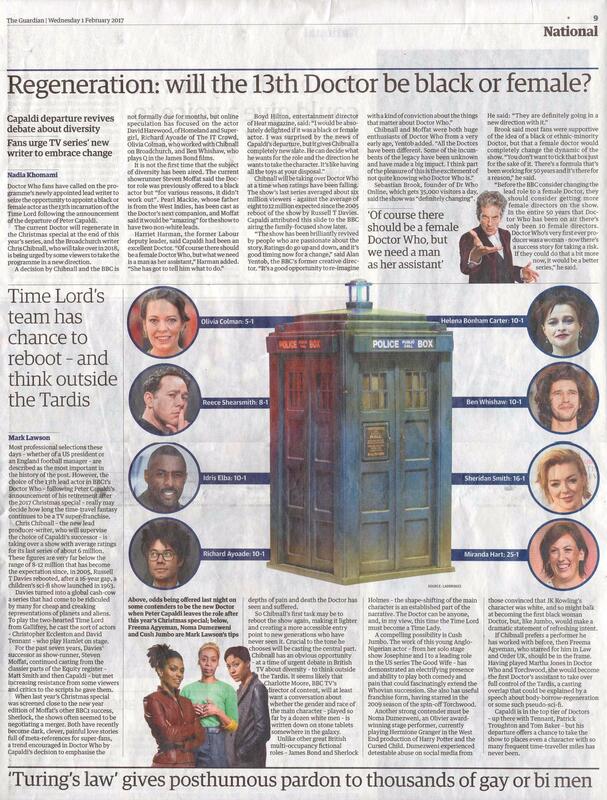 "Of course there should be a female Doctor Who, but what we need is a man as her assistant," Harman added. "She has got to tell him what to do." Chibnall will be taking over Doctor Who at a time when ratings have been falling. The show's last series averaged about six million viewers - against the average of eight to12 million expected since the 2005 reboot of the show by Russell T Davies. Capaldi attributed this slide to the BBC airing the family-focused show later. "The show has been brilliantly revived by people who are passionate about the story. Ratings do go up and down, and it's good timing now for a change; said Alan Yentob, the BBC's former creative director. "It's a good opportunity to re-imagine with a kind of conviction about the things that matter about Doctor Who." Sebastian Brook, founder of Dr Who Online, which gets 35,000 visitors a day, said the show was "definitely changing". He said: "They are definitely going in a new direction with it." Brook said most fans were supportive of the idea of a black or ethnic-minority Doctor, but that a female doctor would completely change the dynamic of the show. "You don't want to tick that box just for the sake of it. There's a formula that's been working for so years and it's there for a reason," he said. "Before the BBC consider changing the lead role to a female Doctor, they should consider getting more female directors on the show. In the entire so years that Doctor Who has been on air there's only been 10 female directors. Doctor Who's very first ever producer was a woman - now there's a success story for taking a risk. If they could do that a bit more now, it would be a better series," he said. Most professional selections these days - whether of a US president or an England football manager - are described as the most important in the history of the post. However, the choice of the 13th lead actor in BBC1's announcement of his retirement after the 2017 Christmas special - really may decide how long the time-travel fantasy continues to be a TV super-franchise. Chris Chibnall - the new lead producer-writer, who will supervise the choice of Capaldi's successor - is taking over a show with average ratings for its last series of about 6 million. These figures are very far below the range of 8-12 million that has become the expectation since, in 2005, Russell T Davies rebooted, after a 16-year gap, a children's sci-fi show launched in 1963. Davies turned into a global cash-cow a series that had come to be ridiculed by many for cheap and creaking representations of planets and aliens. To play the two-hearted Time Lord from Gallifrey, he cast the sort of actors - Christopher Eccleston and David Tennant - who play Hamlet on stage. For the past seven years, Davies' successor as show-runner, Steven Moffat, continued casting from the classier parts of the Equity register Matt Smith and then Capaldi - but met increasing resistance from some viewers and critics to the scripts he gave them. When last year's Christmas special was screened close to the new year edition of Moffat's other BBC]. success, Sherlock, the shows often seemed to be negotiating a merger. Both have recently become dark, clever, painful love stories full of meta-references for super-fans, a trend encouraged in Doctor Who by Capaldi's decision to emphasise the depths of pain and death the Doctor has seen and suffered. So Chibnall's first task may be to reboot the show again, making it lighter and creating a more accessible entry point to new generations who have never seen it. Crucial to the tone he chooses will be casting the central part. Chibnall has an obvious opportunity - at a time of urgent debate in British TV about diversity - to think outside the Tardis. It seems likely that Charlotte Moore, BBC TV's director of content, will at least want a conversation about whether the gender and race of the main character - played so far by a dozen white men - is written down on stone tablets somewhere in the galaxy. Unlike other great British multi-occupancy fictional roles - James Bond and Sherlock Holmes - the shape-shifting of the main character is an established part of the narrative. The Doctor can be anyone, and, in my view, this time the Time Lord must become a Time Lady. A compelling possibility is Cush Jumbo. The work of this young Anglo-Nigerian actor - from her solo stage show Josephine and Ito a leading role in the US series The Good Wife - has demonstrated an electrifying presence and ability to play both comedy and pain that could fascinatingly extend the Whovian succession. She also has useful franchise form, having starred in the 2009 season of the spin-off Torchwood. Another strong contender must be Noma Dumezweni, an Olivier award-winning stage performer, currently playing Hermione Granger in the West End production of Harry Potter and the Cursed Child. Dumezweni experienced detestable abuse on social media from those convinced that JK Rowling's character was white, and so might balk at becoming the first black woman Doctor, but, like Jumbo, would make a dramatic statement of refreshing intent. If Chibnall prefers a performer he has worked with before, then Freema Agyeman, who starred for him in Law and Order UK, should be in the frame. Having played Martha Jones in Doctor Who and Torchwood, she would become the first Doctor's assistant to take over full control of the Tardis, a casting overlap that could be explained by a speech about body-borrow-regeneration or some such pseudo-sci-fi. Capaldi is in the top tier of Doctors - up there with Tennant, Patrick Troughton and Tom Baker - but his departure offers a chance to take the show to places even a character with so many frequent time-traveller miles has never been. APA 6th ed. : Lawson, Nadia Khomami, Mark (2017-02-01). Regeneration: will the 13th Doctor be black or female?. The Guardian p. 9. MLA 7th ed. : Lawson, Nadia Khomami, Mark. "Regeneration: will the 13th Doctor be black or female?." The Guardian [add city] 2017-02-01, 9. Print. Turabian: Lawson, Nadia Khomami, Mark. "Regeneration: will the 13th Doctor be black or female?." The Guardian, 2017-02-01, section, 9 edition. This page was last modified on 24 February 2018, at 00:32.